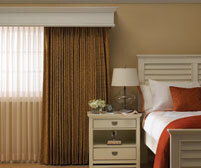 An industry first, the Lutron Kirbé vertical drapery system smoothly pulls fabric up and completely out of the way - unlike traditional draperies that move from side-to-side. 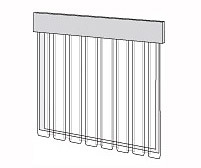 This unique design provides greater access to windows and views by eliminating the creation of stack back. 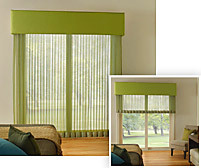 Kirbé vertical drapery system utilizes a roller 100™ shade drive. 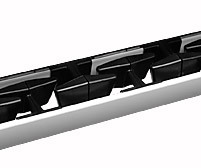 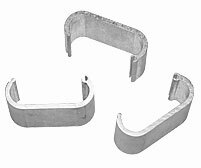 The standard Kirbé bracket includes provisions for mounting an optional Lutron roller shade, which can be integrated during installation or added at a later time. 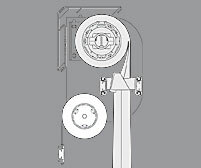 Depending on the width of the drapery, brackets can be selected that accept either a roller 64™ or a roller 100 shade drive.